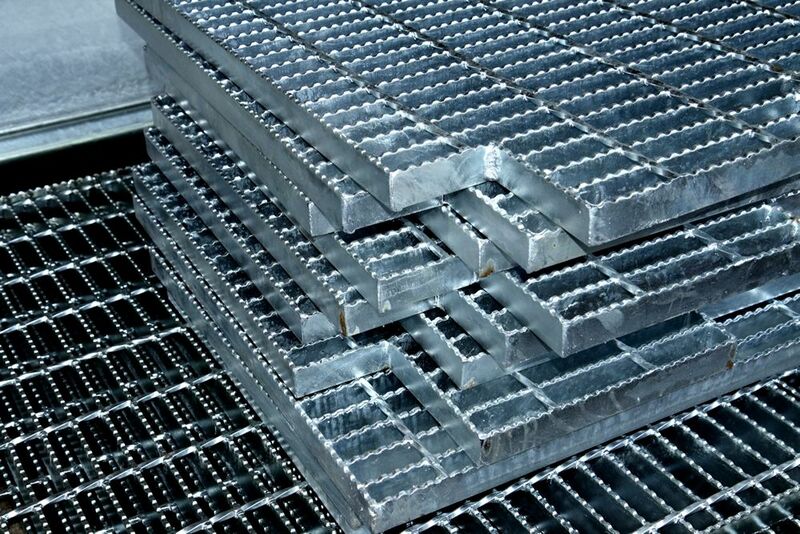 RECTAGRID is formed by the unique Mentis process of compressive locking of bearer bars and transversals. 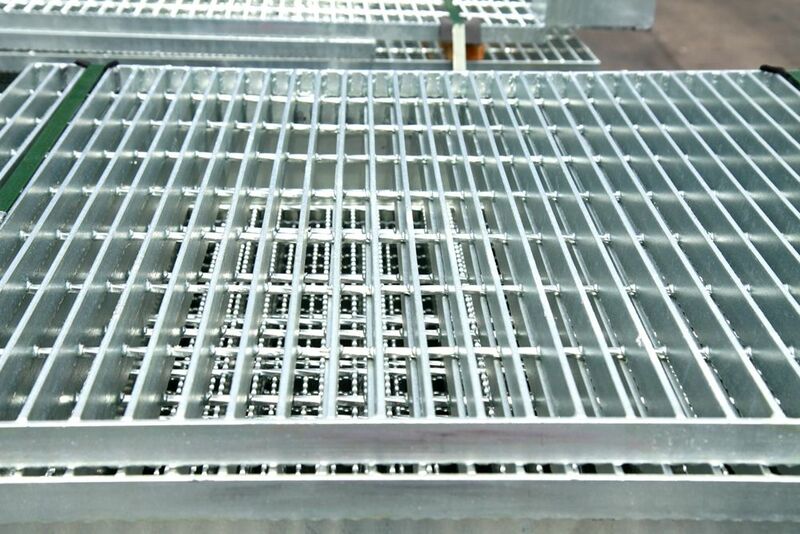 This process ensures permanent locking and accurate bearer bar pitching and results in the industry's finest grating. The RECTAGRID OPEN ENDED SYSTEM or O.E.S. eliminates the banding of panels, improves appearance, simplifies design and erection and reduces costs. Due to the absence of welding, less corrosion occurs. Accurate pitching gives and aesthetically pleasing pattern matching and unjointed appearance when joining open ended panels. All transverse bars are 7.6mm in diameter. All RS4O RECTAGRID panels finish on half pitches in both directions with allowance for 4mm clearance between panels. Saddle clamps will automatically hold panels in at full pitch spacing. Calculation can therefore be based on full pitches in both directions without making any allowances for clearance between panels. Standard O.E.S. panels are available at prices considerably lower than those for banded panels. Customers using standard panels to cut and fit on site, save in drawing office time and labour. RS4O -25 bearer bars per metre width at 40 mm pitch. RS8O - 13 bearer bars per metre width at 80mm pitch. Both RS4O and RS8O are available with non-slip dimples. Mild Steel Uncoated, bitumen dipped or galvanised. Other paint specifications on application. Prices are based on standard lengths and widths as is the tables on the left. Where intermediate lengths and widths are required, the price is based on the next higher standard length or width. Cutting charges will apply in certain cases. The tables on the left will help users design supporting steelwork to the same module and so eliminate unsightly banding and costly welding. The only banding which need to be used will be that welded around unsupported cut-outs. 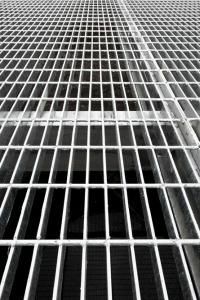 Note: Rectagrid grating has a maximum width of 1440mm and a maximum length of 4760mm. The tables on the left are based on maximum fibre stress of 165 MPa. The panels are assumed to be simply supported. The loads shown in orange type are reduced so that the maximum deflection of span/200 or 10mm, whichever is the lower, is not exceeded. - 25 bearer bars per metre width. - 13 bearer bars per metre width. The bearer bar spacing for the stairtreads should not exceed 40mm due to the concentrated loads to which stairtreads are subjected. A side plate is welded to each side of the stairtread for bolting to supports. These side plates are punched to accommodate 12 mm diameter bolts at centers shown for the various tread widths. 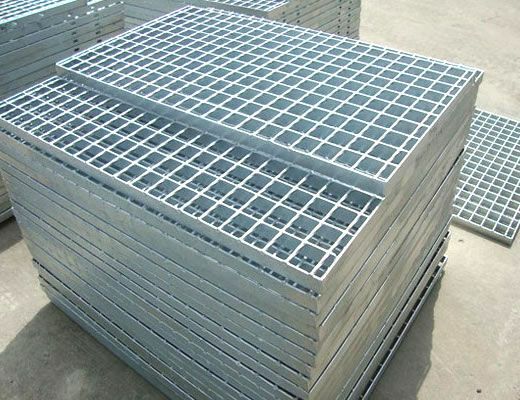 Special designs of side plates, non standard punching or non standard sizes can be supplied to customer's specification. Treads can also be manufactured without side plates for welding direct to stringers, tank sides etc. Prices are subject to quotation.